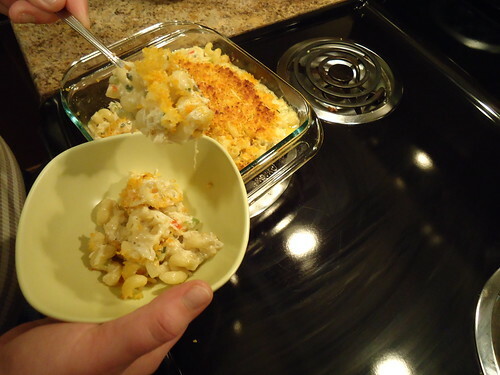 kicked up mac n’ cheese is just about as good as the plain ol’ mac n’ cheese. this particular dish is not as cheesy as i would have liked for it to be, but it is probably for the best. this does taste just like a crab cake and too much cheese would probably kill all of those delicious flavors. i also understand why crab cakes are so expensive! 1/2 lb. of fresh crab meat put me back $10.99. also, be prepared to use a lot of pans for this dish. with all that said, it’s still worth it to make this dish. bring a large pot of water to boil, salt the water. add pasta and cook a minute short of the box directions. drain and add it to a large bowl. in a medium saucepan over medium heat, add 2 tbsp evoo and 1 tbsp butter, melting the butter. then add celery, onion, red pepper, garlic, bay leaf, thyme, lemon zest, salt and pepper (to taste). cook until tender, 6-8 minutes. 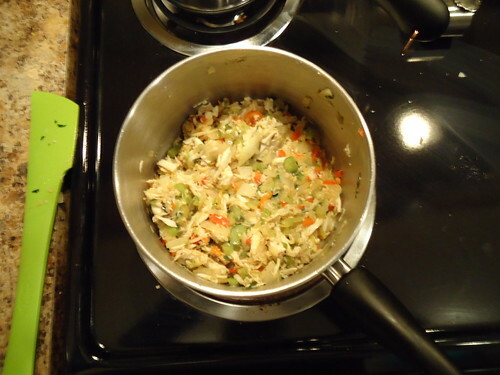 add the crabmeat and old bay seasoning to the vegetables. stir to combine, then remove from heat. (see pic above). melt 2 tbsp of butter in a small non-stick pan over low heat and add 3 tbsp frank’s hot sauce. warm and then add the panko and toss to evenly coat the crumbs. cool the crumbs and then toss with parsley and parmigiano reggiano cheese. in a medium non-stick pan over medium heat, melt 3 tbsp butter and whisk in the flour. cook for 1 min., then whisk in the milk and bring to a bubble (you may need to turn the heat up a bit for this). season the sauce with salt, pepper and nutmeg, to taste. cook for a few more minutes, until the mixture starts to thicken. add mustard and cheese and whisk until combined. 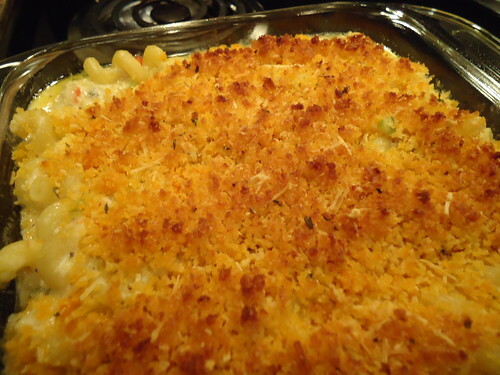 fold vegetable mixture and cheese sauce in with the pasta. pour into a greased 9″ baking dish. top with the crumb mixture. bake until browned and heated through, or about 10 min.